At its European conference in Hamburg this week Panasonic showed off a new bit of concept kit for its Wi-Fi compact camera line-up – the ability to control a camera with your smartphone. This technology isn't new – Samsung debuted its own version of it with the Samsung SH100 and its ability to link up with the Samsung Galaxy S – but it is uncharted territory for Panasonic, which has only just revealed its back in the smartphone market with the Panasonic Eluga. 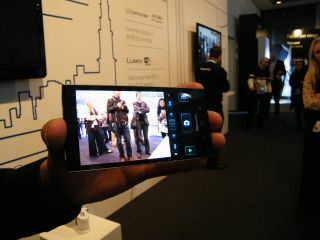 TechRadar was given a demo of the technology which uses an as-yet-unreleased smartphone app which mirrors the view from the camera on to a Panasonic Eluga, allowing you complete control of the camera from the phone's touchscreen. This virtual tethering is done through Wi-Fi and in realtime. Once you have taken the photo, then you will be able to transfer images to your smart TV, via the phone's Viera Connect app and through just a flick of the finger. Given that the Viera Connect app is also available on iOS devices, we're expecting this remote control app to not be exclusive to Pansonic smartphones. Panasonic didn't have an actual release date for the technology but given that there's Wi-Fi enabled Panasonic compacts in the market at the moment - in the form of the Panasonic FX90 - and the Panasonic Eluga UK release date is April, there's no reason why we won't see it come some time in the second half of 2012.